The ancestral home of the psychedelic movement is no place other than ole' Frisco. The jived-out mind-mucking sounds which have boiled from its bay have ranged from the swirling free-wheeling rock of Jefferson Airplane, to the crusty down-to-earth brutality of several very notable thrash groups. 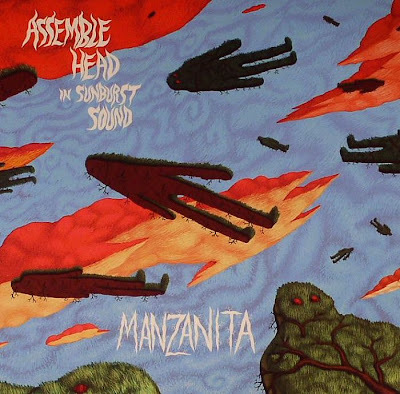 Today we're going to focus on a new record from a lesser-known but very wigged-out San Fransisco band named The Assemble Head in Sunburst Sound. 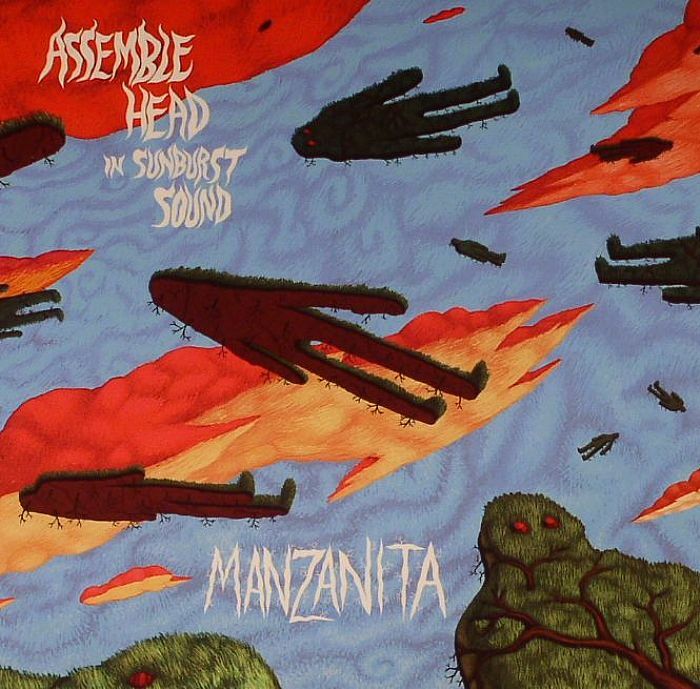 Their new record Manzanita continues to press that trippy spirit into our minds- as the band has been doing since their inception in in the early 2000s. 1. "LA Sacrifice" - A groovy tune that seems to have spliced The Airplane's DNA with that of MC5. A droning groovy riff permeates the tune, but of course- a delicious slicing of organ is thrown in there to capture that old school vibe. A foot-stomping how-to on mid-sixties psychedelia. 2. "(Gone) 'Round the Corner" - It starts off as a jivin countryish tune with shimmering guitar tones and delicious harmonies. It kicks into some overdrive and acts like a rocker before turning back to the smooth clean tones- and than reverting again before drifting into a slower jam. This band kind of captures a shoegazey indie tone by the end. 3. "Blue Wire" - Echoed-vocals layered on a repeating minor riff- this one is oozing soul. It drifts in between grooving mellow rock until culminating into a fuzzed out guitar solo by the middle. It takes out with some cutting rhodes tones in between verses before shooting up into a calmed down effects-laden space-outro. These cats groove out into the beyond - with some great basswork and rippling delayed guitar sounds! 5. "Ghost String"- This tune evokes the desert with spooky over-reverbed vocals and funky surf-rock style guitar. There is a definitive 90s sound overlooking this one - it's almost pearl-jam-ish in a way. 7. "Green Meadown Slowdown" - FLUTE! These guys do dig on the contright notions of former psychedelia- but there's a reason for that. It sounds great! Another Neil Youngish- number, it grooves on with sporadic flute interplay and powerful simple grooves. 8. "The Flume"- This tune has the markings of a staple with rolling oddness for lyrics and a Who-style swagger. The longing and yearning vocals sort of begs the heartbreak and morose beauty that the aforementioned group could offe. 9. "Low Island Blues"- A driving rocker with an anthemic underpinnings. A nah-nah-nah chorus encapsulates the hook and the tune jams for a while with heavy organ and guitar work. A bit bluesy, a but it has that punchy early-punk spirit. This is a record for anyone who likes the nostalgic tones of the 60s, those acting as Classic Rock standard bearers, and those who like damn good hooks. It's punchy, its spunky, its rock and roll in one of its purest forms. Do yourself a favor and crank it- as it should be! great write-up! i'm loving l.a. sacrifice, i guess i'll have to check the rest of this one out. my favorite album of 2012. wish i could find others like it.